Our buddy Arlen Schumer’s next lecture is 11/15 in Manhattan. If you’ve never seen one of Arlen’s “VisuaLectures,” you’re missing out. The guy’s got so much energy it’s infectious and you can’t help but get caught up in whatever his chosen topic is. 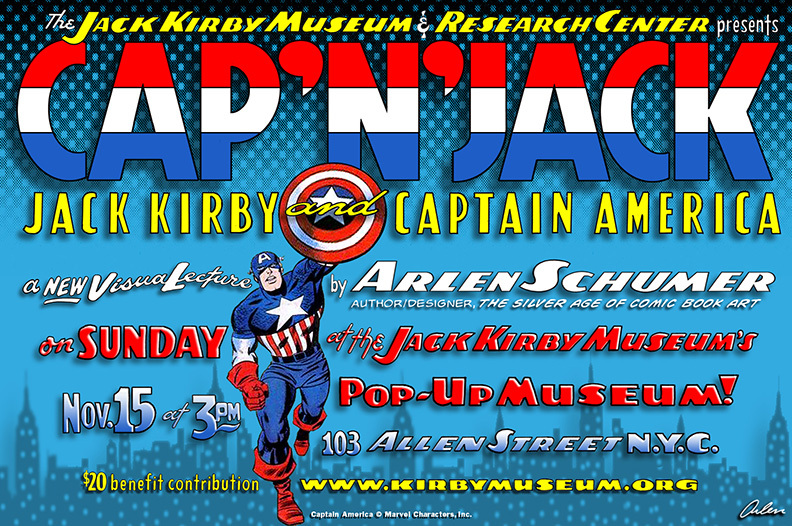 This weekend, it’s Jack Kirby and Captain America, and his lecture is just one of many events over the next few weeks at the pop-up Jack Kirby Museum on the Lower East Side. The Kirby Museum will be open for three weeks, until 11/29. This year’s exhibition is titled Comics Combatives: Stories Told by Jack Kirby Pfc. The show’s theme is built around Kirby’s depictions of heroic combat, in both war and superhero comics. Thanx for the plug, Dan! I’m calling it a Master’s Class in Kirby–using Capt America as the primer!